Ah, how beautiful the Weald looked! The hills stood out above its radiance, as Fiesole stands above the Tuscan plain, and the South Downs, if one chose, were the mountains of Carrara. She might be forgetting her Italy, but she was noticing more things in her England. 1 Hollinghurst’s novel also echoes Henry James’s “The Pupil” (1891). 1Alan Hollinghurst’s second work of fiction, The Folding Star (1994), like his other five published novels – among which The Swimming-Pool Library (1988) and the Booker-prize winning Line of Beauty (2004) – offers a reappropriation of former narratives, a rewriting of the canon (see Letissier). In that respect, The Folding Star partakes of a palimpsest, as its paratext already makes clear. The title of the novel evokes the pastoral tradition and is a double reference to Comus(1634), a masque by John Milton (“The Star that bid the shepherd fold /Now the top of heaven hold,” l. 93-94; quoted in The Folding Star 216) and to “Ode to Evening” (1746) by William Collins (“For when thy folding star arising shows /His paly circlet […],” l. 21-22, quoted in The Folding Star 247). The epigraph in French is an extract from Henri de Régnier’s 1892 collection of poems Tel qu’en songe (Asina Dream), more specifically from “Quelqu’un songe de soir et d’espoir” (“Someone Dreams of Evening and Hope”), which was set to music by Maurice Ravel in 1906: “Les grands vents venus d’outremer /Passent par la Ville, l’hiver, /Comme des étrangers amers” (Régnier 31, l. 1-3; [“The great winds from overseas /Pass through the Town in winter /Like bitter strangers”]). Within its pages, The Folding Star weaves a dense intertextual network, bringing to mind George Crabbe’s The Borough (1810), Henry James’s TheTurn of the Screw (1898)1 and Thomas Mann’s Death in Venice (1912), as well as their operatic adaptations by Benjamin Britten (Peter Grimes, 1945, based on Crabbe’s 1810 poem; The Turn of the Screw, 1954; Death in Venice, 1973) (Johnson 64). 3Besides evoking Belgian Symbolist poet Émile Verhaeren’s Flemish landscapes (“Le moulin” [“The Mill”], for example, Letissier 204), The Folding Star seems to be haunted by Belgian writer Georges Rodenbach’s 1892 novel, Bruges-la-Morte, composed six years before his death. Hollinghurst himself acknowledged the debt to Bruges-la-Morte in a 1994 interview (Pateman 17) and even wrote a preface for an English translation of Rodenbach’s novel published in 2005 by Dedalus.3 Both Bruges-la-Morte and The Folding Star share a similar setting. Both are dark tales of passion concerned with the duplication motif. In the 1892 novel, widower Hugues Viane takes refuge in Bruges, where he lives among the relics of his former wife and becomes obsessed with a dancer who bears a likeness to his dead spouse. Yet, if the debt that Hollinghurst’s narrative owes to Bruges-la-Morte has already been explored (see Stead), what has not sufficiently been stressed is the extent to which both works engage in a dialogue between text and image. As Jean-Pierre Bertrand and Daniel Grojnowski underlined in their 1998 edition of Rodenbach’s novel, Bruges-la-Morte is fundamentally based upon the relation- ship between the text and the thirty-five black-and-white photographic illustrations which initially ac- companied it. Those illustrations, reproduced using a halftone engraving technique, form an intrinsic part of the original edition, as Rodenbach’s prefatory note makes clear (Rodenbach 1998, 49-50).4 Bruges-la-Morte relies upon the paradox inherent in the juxtaposition of an allusive, poetic prose and apparently realistic photographs to illustrate it. Another important visual component of the 1892 edition of Bruges-la-Morte is the frontispiece by Fernand Khnopff [fig. 1]. In The Folding Star, Hollinghurst reappropriates that visual dimension by repeatedly resorting to ekphrasis, literary descriptions of – or commentaries on – visual works of art, thus linking together text and image. 4In this article, I wish to explore a dual form of reappropriation in this article. On the one hand, I would like to show the extent to which The Folding Star rewrites Rodenbach’s Symbolist novel. On the other hand, I intend to analyse the way in which Hollinghurst transposes the text/ image binary at the core of Bruges-la-Morte. My aim is to explore the acts of intercultural and inter- medial translation at work in Hollinghurst’s novel, a programme which, incidentally, harmonizes with a polyglot novel, situated in Belgium, an (albeit reluctantly) bilingual, bicultural country. 8 The hybrid thus fostered is not unlike Wilde’s 1894 Sphinx (The Sphinx 874-883). 6“Rather like A.E. Housman laying claim to an imagined Shropshire while walking on Hampstead Heath, Rodenbach evoked the dead city where he had never lived from his Paris apartment.” Alan Hollinghurst writes this in his 2005 introduction to Rodenbach’s novel (14), thus drawing a parallel between an English and a Belgian author and also suggesting that the 1892 novel paints a cityscape of Bruges from memory and imagination. The map of the Flemish city that Bruges-la-Morte – and The Folding Star in its wake –, draws is at once realistic and oneiric. Admittedly, such landmarks as the belfry or the GroteMarktare mentioned (Rodenbach 1998, 88; Rodenbach 2005, 41; Hollinghurst 12). The two novels open with an account of two of their main characters – Edward Manners and Hugues Viane – wandering in the town (Rodenbach 1998 51-52; Rodenbach 2005, 25; Hollinghurst 3) and later show the protagonists stalking their respective objects of desire – Jane Scott and Luc Altidore – through the streets (Rodenbach 1998, 77-79; Rodenbach 2005, 35-36; Hollinghurst 43-44). Yet, in both cases, the city comes out as uncanny, labyrinthine and unreal, acting as an objective correlative to the protagonists’ states of mind.9 As Rodenbach writes in his prefatory note, the town is “an essential character” in the novel (Rodenbach 2005, 21; [« un personnage essentiel », Rodenbach 1998, 49]), an idea further expounded in chapter 10, when the narrator explains that “[e]very town is a state of mind, a mood which, after only a short stay, communicates itself, spreads to us in an effluvium which impregnates us, which we absorb with the very air” (Rodenbach 2005, 93 [« Toute cité est un état d’âme, et d’y séjourner à peine, cet état d’âme se communique, se propage à nous en un fluide qui s’inocule et qu’on incorpore avec la nuance de l’air », Rodenbach 1998, 193]). The idea of a dead, silted-up, out of time town is also articulated in The Folding Star: “[…] I couldn’t quite admit to myself the uncertainty I felt already at its deadness, its air of a locked museum, the recognition that what had happened had all been centuries ago” (7).10 Curiously enough, an impression of unreality also emanates from the photographic illustrations that adorn the 1892 edition of Bruges-la-Morte. The thirty-five images, regularly interspersed in the text, represent the canals, quays, churches, buildings, streets, squares, and gates of Bruges and, at first sight, have a documentary, postcard-like quality.11 They picture such sights as the belfry (Rodenbach 1998, 91), the béguinage (155) and the Lake of Love (151). Yet the conspicuous absence of human figures, but for a few exceptions,12 endows them with a ghostly quality. 7For instance, the first two illustrations [figs. 2 & 3] represent the same location – the canal and the béguinage – from slightly different perspectives. Although the reader/viewer is made to move forward, closer to the bridge and with a clearer view of the belfry, the same impression of stillness prevails and emphasis is similarly placed upon the reflections of the trees and buildings on the motionless waters of the canal, a motionlessness which can be accounted for by the long exposure time that was required by the photographic techniques of the time (Edwards 43). 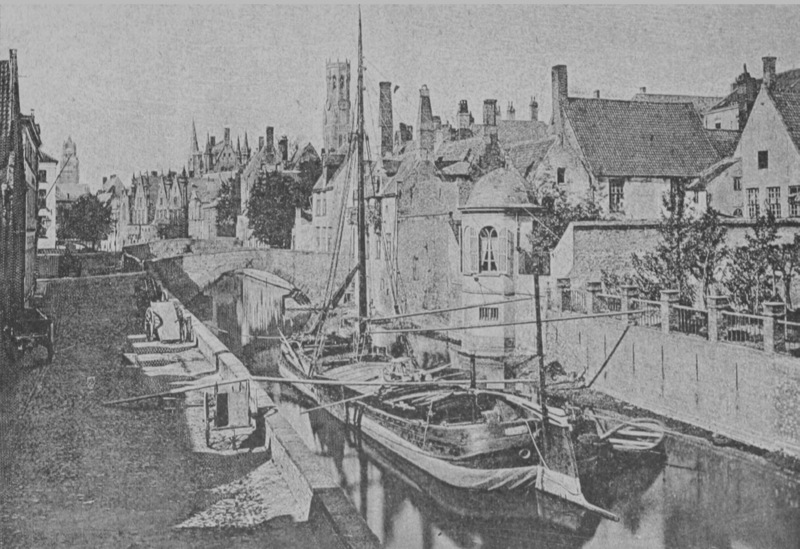 Figure 2: Bruges-la-Morte, illustration 1. Paris: Flammarion, 1892, p. 1. 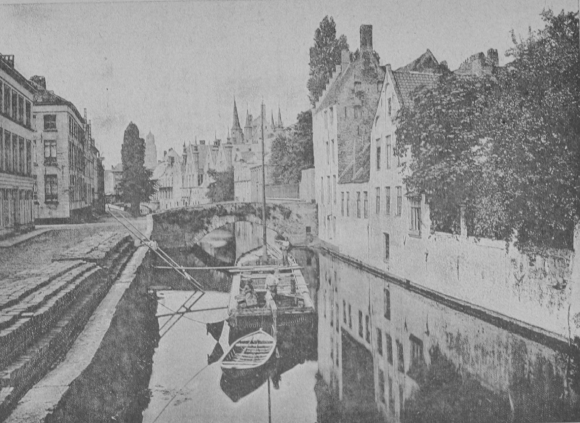 [The canal and Béguinage]. 9A variation on Salomé’s mother Herodias, who is one of the most emblematic figures of both Symbolist art and literature (Marchal 125-132),15 the imaginary painting somewhat defiantly beckons to the character (the title translates as “Herodias in days of yore, what next?”) and takes the reader into a world which weaves together two fins de siècle – the ends of the nineteenth and twentieth centuries – and two cultural traditions – Belgian and English. 10The topos of the picture-gallery points to a feature shared by Edward Manners, Edgard Orst and Hugues Viane, namely their compulsive taste for collection, which borders on fetishism and attests to their narcissism. Is not the aim of collection always ultimately to collect oneself? In the seventh chapter of Bruges-la-Morte, the reader is taken through a guided tour of Viane’s private gallery, which only contains portraits of his dead wife (Rodenbach 1998, 138; Rodenbach 2005, 65). The one major piece in Viane’s collection however is his dead wife’s hair, put under glass and set on the piano as “a cut-off plait, a broken chain, a rope saved from the shipwreck” (Rodenbach 2005, 28; [ « tresse interrompue, chaîne brisée, câble sauvé du naufrage », Rodenbach 1998, 61]). It henceforth becomes a religious relic to be worshipped, in a parody of a Catholic ritual, and to be placed in parallel with the two reliquaries, that of St Ursula and that of the Holy Blood pictured in the illustrations (Rodenbach 1998, 207, 263) [figs. 4 & 5]. Both text and image point to a literalisation of the logic of metonymy at the core of Bruges-la-Morte, whereby a correspondence is established between the cut-off plait and the dead woman. This fetishism is ironically echoed in The Folding Star when Edward steals Luc’s underpants (145) or when he helps out his lover Matt, a shady character who makes a business of selling young men’s dirty underwear to older men ready to “spend a fortune on a sixth-former’s Y-fronts or a really sweaty kind of yucky jock-strap” (157). 11Bruges-la-Morte and The Folding Star finally have in common a concern with visuality and scopophilia. Both Hugues Viane and Edward Manners are voyeurs, deriving pleasure from the mere act of looking (see for instance Hollinghurst 102-116, when Edward goes to the seaside resort of St-Ernest-aux-Sablonnières for the sole purpose of spying on Luc). Theirs is also a flawed, partial or blurred vision. Edward’s short-sightedness is repeatedly insisted on (Hollinghurst 22, 280), as well as Orst’s near-blindness because of syphilis (280), whilst Bruges-la-Morte finally underscores the main character’s optical illusion consisting in seeing a likeness between his dead wife and the dancer Jane Scott (“Hugues was suffering. Day by day the dissimilarities were increasing. He could no longer maintain the illusion, as far as her physical appearance was concerned,” Rodenbach 2005, 102; [« Hugues souffrait ;de jour en jour les dissemblances s’accentuaient. Même au physique, il ne lui était plus possible de s’illusionner encore », Rodenbach 1998, 215]). Both Edward and Hugues are narcissists,16 as the pervasive presence of mirrors and reflecting surfaces in the novels testifies (Rodenbach 1998, 52, 53, 70, 121; Rodenbach 2005, 25, 33, 56; Hollinghurst 11, 22, 59, 89, 119, 166, 391). Theirs is the eye of the melancholy man, described by Starobinski as “staring at the insubstantial and the perishable, at [his] own reflected image” (« L’œil du mélancolique fixe l’insubstantiel et le périssable : sa propre image réfléchie ». [Starobinski 50]). Gazing at The Folding Star through the looking glass of Bruges-la-Morte thus allows us to lay bare the various strategies of duplication and repetition upon which Hollinghurst’s novel is based. 12In chapter 6 of Bruges-la-Morte, Rodenbach develops a meditation upon what he calls the “indefinable” power of resemblance (Rodenbach 1998, 127-129; Rodenbach 2005, 60-61). More generally, the novel hinges on the ideas of sameness and difference: the mirror that is held up to an object is liable to send back an imperfect, distorted reflection of it. Bruges-la-Morte is structured around two main analogies. The first correspondence is between the city of Bruges and Viane’s dead wife, introduced through a chiasmus: « Bruges était sa morte. Et sa morte était Bruges. Tout s’unifiait en une destinée pareille. C’était Bruges-la-Morte, elle-même mise au tombeau de ses quais de pierre, avec les artères froidies de ses canaux, quand avait cessé de battre la grande pulsation de la mer » (Rodenbach 1998, 69 [“Bruges was his dead wife. And his dead wife was Bruges. The two were united in a like destiny. It was Bruges-la-Morte, the dead town entombed in its stone quais, with the arteries of its canals cold once the great pulse of the sea had ceased beating in them,” Rodenbach 2005, 33]). The second analogy is between his dead wife and a dancer, Jane Scott, who, he initially thinks, is the exact likeness of his dead wife: « Son œil avait emmagasiné le cher visage une nouvelle fois ; la récente empreinte s’était fusionnée avec l’ancienne, se fortifiant l’une par l’autre, en une ressemblance qui maintenant donnait presque l’illusion d’une présence réelle » (Rodenbach 1998, 82-85; [“His eye had stored up a fresh image of the beloved face. The recent impression had fused with the old one, each reinforcing the other in a likeness which had almost come to give the illusion of a real presence,” Rodenbach 2005, 39]). The illusion of resemblance however gradually vanishes and the love affair between Viane and Jane turns into tragedy. The thing was that she looked uncannily like Jane Byron; rather statuesque with of course the amazing red hair – orangé was his word, I think quite literal. […] He followed her on the tram and followed her when she got off. He felt he was seeing an apparition, as if the image he had been painting over and over for the past twenty years had suddenly come to life – come back to life, as it were. (Hollinghurst 290). 15In his introduction to the 2005 English translation of Bruges-la-Morte, Hollinghurst writes disparagingly about the photographic illustrations to the novel’s first edition published in 1892 by Flammarion. He underlines the discrepancy between the “obscure Symbolist refinement” of Rodenbach’s poetic prose and what he calls “the illustrations of a Baedeker” (Rodenbach 2005, 12). This idea echoes the prejudices of earlier critics, such as Thomas Duncan, the first translator of Rodenbach’s novel, who specifies in a note following his preface: “The illustrations referred to in the foregiving preface have been, for the most part, omitted in this translation, as they do not appear to succeed in conveying the imaginative impression intended by Rodenbach” (Rodenbach 1903, 65). I would tend to disagree, for a number of reasons. First of all, these illustrations, which endlessly feature the same places and the same buildings – the quai du Rosaire, for instance, onto which the windows of Hugues Viane’s residence look, is pictured four times (Rodenbach 1998, 83, 94, 139, 271) [figs. 6-7-8-9], with subtle variations of standpoints – harmonize with the poetics of stasisthat the narrative develops and with the reflection upon sameness that the novel offers. Besides, the illustrations do not merely repeat or mirror the text (and rarely precisely correspond to it),23 but rather act as counterpoints to the diegesis, establishing with it a relationship of discontinuity and/or commentary. They materialise a form of chance reading as advocated by Mallarmé24. 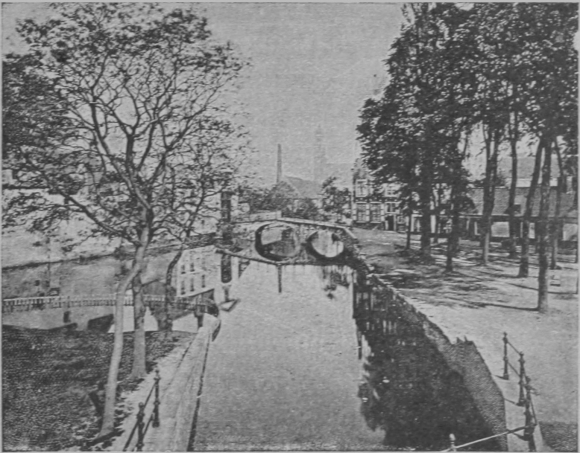 16The canals and their reflecting surfaces, a prominent feature in Bruges-la-Morte and its illustrations, are conspicuously absent from the topography of the Flemish city in which Hollinghurst sets the action of The Folding Star. My contention is that Hollinghurst treats the motif metaphorically and transposes it in the very writing strategy for which he has opted. Just as the multiplicity of reflections in the still waters of the canal [fig.9] elicits a meditation upon the notion of reality, I would argue that TheFoldingStarreflects and refracts Rodenbach’s Symbolist novel and breeds a hybrid, and eventually enigmatic, creature. 17The Folding Star sometimes playfully blends languages, as, for instance, during a discussion between Edward and his friend Edie about the trio formed by Luc, Edward’s paramour, and his two friends Patrick and Sibylle: “‘Un trio n’excite pas de soupçons.’ ‘Well, my soupçons have never been more excités in their lives’” (153). It features a main character whose mother’s tongue is Dutch (27, 131, 218), who can speak French and teaches English: his private lessons to Luc and his other pupil, Marcel, are comic vignettes, recalling Christopher’s classes in Isherwood’s Goodbye to Berlin (1939) (Hollinghurst 28-31, 59-62, 117-121). Hollinghurst’s novel is generally concerned with acts of translation, both linguistic and cultural, and documents the two-way cultural exchanges between Belgium and Britain in the late nineteenth century. It is worth noticing that Rodenbach himself was in an in-between situation, being both a French-speaking Flemish (as were the other members of the more privileged classes in Belgian Flanders at the time) – who drew upon Flemish culture in his works (the description of the procession of the Holy Blood in the thirteenth chapter of Bruges-la-Morte, for instance) – and a Belgian who spent the last ten years of his life in Paris and whose poetics is described as being based on a “to-and-fro movement” between his native land and his adoptive country (Rodenbach 1998, introduction, 44). 27 Khnopff also entitled a drawing from 1891 Who shall deliver me? (collection N. Manoukian). 18In The Folding Star, Edgard Orst’s house is the aptly named “Villa Hermès,” thereby placing the artist under the aegis of the messenger of the Gods, “the interpreter between worlds, the god of communication, associated with commerce and secrets” (Stead 361). Orst is said to have been famous in England (36); some of his works are exhibited in museums in the United Kingdom, such as in the British Museum and in the (imaginary) Corley-Cripps Museum in Eastbourne (36-37). The novel also embeds a (fictional) article by an English journalist’s recounting a visit to Orst’s house in 1904 (182- 185), and it emphasises the influence of English artists upon Orst’s works. As a boy, Orst was set the task of copying his grandfather’s English watercolours before being allowed to paint Belgian landscapes (281). He is also reported to have been influenced by – and to have befriended – Edward Burne-Jones (67). This testifies to the extent to which Hollinghurst drew on anglophile Fernand Khnoppf’s life and works to create the character of Orst. Fernand Khnopff, and his brother Georges (who translated Walter Pater and Oscar Wilde into French),25 were cultural intermediaries between Britain and Belgium. The discovery of Burne-Jones at the 1878 Paris exhibition was a key-element in the evolution of Fernand Khnopff’s career: the two artists expressed their mutual esteem by exchanging gifts of their drawings (Draguet 175).26 Another major influence on Khnopff was Dante Gabriel Rossetti. In Hollinghurst’s novel, Orst’s masterpiece is entitled La Porte Entr’ouverte (66-67), possibly an echo to Khnopff’s I Lock My Door Upon Myself [fig. 10]. One of Khnopff’s most obvious debts to Dante Gabriel Rossetti is the Belgian artist’s 1891 I Lock My Door Upon Myself, which features a dreamy-eyed, red-haired Pre-raphaelite creature in the centre of the composition. The title is the seventh line of “Who Shall Deliver Me?”27 a poem by Christina Rossetti, Dante Gabriel’s sister, offering a picture of a fractured self, imprisoned in a self-constructed cell, stylistically represented through a system of echoes, repetitions and anaphoras (Rossetti 88-89), for instance of the phrase “I lock myself” (l. 5 and 7). The oil on canvas by Khnopff ushers the viewer into a closed, oneiric world, juxtaposing and reassembling disconnected fragments (a bust of Hypnos, the Greek god of sleep, a poppy, a charm dangling from a chain). The status of the rectangular frame to the right of the composition is ambiguous: is it a window opening onto a landscape or a painting within the painting? 29 She is painted as Ophelia by Orst (Hollinghurst 297). 20This enigmatic final vision suggests that Luc is one of the disappeared, yet another drowned Ophelia, or an Antinoüs engulfed in the waters of the North Sea, to whom the whole novel would be a mausoleum erected by Edward, a new Hadrian. Luc has become a revenant forever condemned to haunt the sea-shore, a grey place akin to the funereal Bruges described by Rodenbach, a liminal space, between Belgium and Britain (Ostend is the harbour from which the ferries bound for Ramsgate leave), between life and death. This mysterious epilogue echoes the final lines of the epigraph by Régnier (« Et les adolescents amers /S’envont avec eux vers la Mer ». [“And the bitter adolescents /Are going away with them towards the Sea”], Régnier 31, l. 10-11). 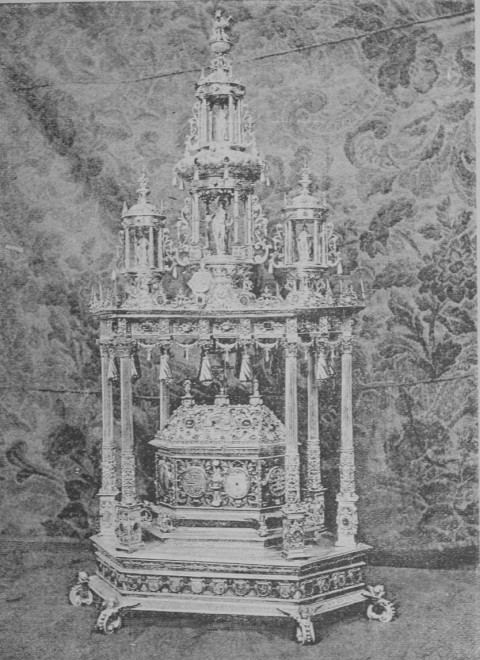 It also reminds us of the function of photography as relic – recalling the pictures of the reliquaries of St Ursula and of the Holy Blood in Bruges-la-Morte [figs. 4 & 5] – a trace of absence, the “ectoplasm of ‘what-had-been’” (Barthes 87), a memento mori. 21The notion of triptych may link together the different modes of reappropriation this article has tried to outline. At the core of Hollinghurst’s novel is the attempt to reassemble a triptych by Edgard Orst entitled Autrefois, dispersed during World War 2. This imaginary painting gives rise to an ekphrasis in the text (278): the panel on the left is “[a] candlelit image of [a] woman whose face [is] only seen in a mirror,” reminiscent of Khnopff’s 1889 Mon cœur pleure d’autrefois,31 in which a woman looks at herself in a mirror with Bruges in the background. The right-hand panel is a seascape and the larger central panel represents a deserted town. The form of the triptych points to Hollinghurst’s own reappropriation of the Symbolists’ reappropriation of medieval altarpieces.32 It sends back to the construction of Hollinghurst’s three-part novel and possibly hints at the importance of the middle section of The Folding Star: a moving English interlude which rescripts the English pastoral through the prism of Belgian Symbolism. The imaginary painting also materialises both the rewriting of Bruges-la-Morte and the two-way relationship between text and image which, in Bruges-la-Morte and The Folding Star alike, mirror and complement each other. To shift metaphors, The Folding Star builds a large chamber of echoes, a melancholy symphony wherein text and image, Belgium and Britain, past and present, respond to each other. AZOURY, Philippe. “Les Obsessions de Khnopff.” Libération. 19 March 2004. Web. 1 September 2015. <http://www.liberation.fr/culture/2004/03/19/les-obsessions-de-khnopff_472904>. BARTHES, Roland. La Chambre claire (Camera Lucida). 1980. Trans. Richard Howard. New York: Hill and Wang, 1981. COLLINS, William. “Ode to Evening.” 1764. Web. 5 June 2015. <http://www.poetryfoundation.org/poem/173259>. COUSSEAU, Anne. “Ophélie: histoire d’un mythe fin de siècle.” Revue d’histoire littéraire de la France 1/2001 (Vol. 101): 105-122. Web. 11 June 2015. <www.cairn.info/revue-d-histoire-litteraire-de-la-france-2001-1-page-105.htm>. CRABBE, George. The Borough. 1810. Web. 5 June 2015. <http://www.gutenberg.org/ebooks/5210>. DESSY, Clément. “Georges Khnopff ou la reconversion cosmopolite de l’homme de lettres.” Textyles [En ligne], 45 | 2014. Web. 13 June 2015. <http://textyles.revues.org/2535>. DRAGUET, Michel. Le Symbolisme en Belgique. Bruxelles: Fonds Mercator/Musées Royaux des Beaux-Arts de Belgique, 2010. EDWARDS, Paul. Soleil noir. Photographie et littérature. Rennes: PUR, 2008. Fernand Khnopff. Exhibition catalogue. Bruxelles: Musées Royaux des Beaux-Arts de Belgique, 2004. FLAUBERT, Gustave. L’Éducation sentimentale. 1869. Paris: Le livre de poche, 1972. FORSTER, E.M. A Room with a View. 1908. London: Penguin, “Penguin Classics”, 2000.
. Maurice. 1971. London: Penguin, 1972. GIUDICELLI, Xavier. “Rewriting the Past: Alan Hollinghurst’s The Stranger’s Child (2011).” The Status of Rewriting in 20th-21st century Literature, Art and Film. Ed. Nathalie Martinière. Paris: Michel Houdiard, 2015. 145-158. HOLLINGHURST, Alan. The Creative Uses of Homosexuality in the Fiction of E.M. Forster, L.P. Hartley and Ronald Firbank. M. Phil Thesis, Oxford University, 1980.
. The Swimming-Pool Library. London: Penguin, 1988.
. The Folding Star. London: Chatto and Windus, 1994.
. The Line of Beauty. London: Picador, 2004.
. “Bruges of sighs.” The Guardian 29 January 2005. Web. 5 June 2015. <http://www.theguardian.com/books/2005/jan/29/featuresreviews.guardianreview30>.
. The Stranger’s Child. London: Picador, 2011. ISHERWOOD, Christopher. Goodbye to Berlin. 1939. The Berlin Novels. London: Random House, 1992.243-490. JAMES, Henry. “The Pupil.” 1891. Web. 5 June 2015. <http://www.gutenberg.org/files/1032/1032-h/1032-h.htm>.
. The Turn of the Screw. 1898. Eds. Deborah Esch and Jonathan Warren. New York/ London: Norton, 1999. JOHNSON, Allan. Alan Hollinghurst and the Vitality of Influence. Houndmills, Basingstoke, Hampshire & New York: Palgrave Macmillan, 2014. KEMP, Peter. “Aesthetic Obsessions.” The Times Literary Supplement, No 4756, May 27, 1994: 19. LETISSIER, Georges. “Queer, Quaint and Camp: Alan Hollinghurst’s Own Return to the English Tradition.” Études anglaises 2007/2 - Volume 60: 198-211. MAETERLINCK, Maurice. Pelléas et Mélisande. 1894. Bruxelles: Labor, 1983. MALLARMÉ, Stéphane. Œuvres complètes. Ed. Bertrand Marchal. Paris: Gallimard, “Bibliothèque de la Pléiade,” 1998. MANN, Thomas. La Mort à Venise. 1912. Trans. from the German by Félix Bertaux & Charles Sigwalt. Paris: Fayard, 1971. MARCHAL, Bertrand. Le Symbolisme. Paris: Armand Colin, 2011. MILTON, John. Comus. 1634. London & New York: Macmillan, 1891. Web. 5 June 2015. <http://www.gutenberg.org/files/19819/19819-h/19819-h.htm>. PATEMAN, Matthew. “Rising Star.” Leeds Independent Student Paper, 24 June 1994. 17. RACINE, Jean. Bérenice and Bajazet. Trans. Alan Hollinghurst. London: Faber, 2012. RÉGNIER, Henri de. Tel qu’en songe. Paris: Librairie de l’Art indépendant, 1892. Web. 5 June 2015. <https://archive.org/stream/telquensonge00rg#page/n7/mode/2up>. RODENBACH, Georges. Bruges-la-Morte. 1892. Eds. Jean-Pierre Bertrand and Daniel Grojnowski. Paris: Flammarion, “GF”, 1998.
. Bruges-la-Morte. Trans. and introduction Thomas Ducan. London: Swan Sonnenschein, 1903. Web. 5 September 2015. 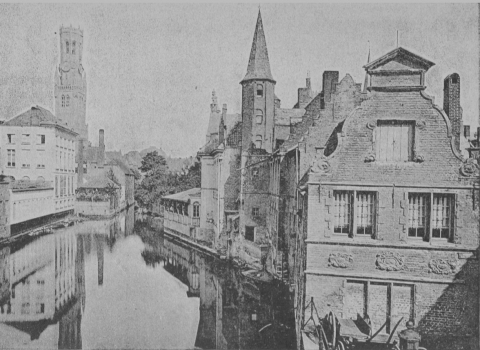 <http://bruges-la-morte.net/wp-content/uploads/Bruges-la-Morte-english-translation.pdf>.
. Bruges-la-Morte. Trans. Mike Mitchell, introduction Alan HOLLINGHURST. London: Dedalus, 2005. ROSSETTI, Christina. Selected Poems. London: Penguin, “Penguin Classics”, 2008. STAROBINSKI, Jean. La Mélancolie au miroir. Trois études sur Baudelaire. Paris: Julliard, 1989. STEAD, Alistair. “Self-Translation and the Arts of Transposition in Alan Hollinghurst’s The Folding Star.” Translating Life: Studies in Transpositional Aesthetics. Eds. Shirley Stew and Alistair Stead. Liverpool: Liverpool UP, 1999. 361-385. WILDE, Oscar. The Picture of Dorian Gray. 1891. Ed. Michael Patrick Gillespie. London/New York: Norton, 2006.
. The Sphinx. 1894. Complete Works. Ed. Merlin Holland. Glasgow/London: HarperCollins, 1994.874-883.
. The Importance of Being Earnest. 1895. Ed. Michael Patrick Gillespie. London/New York: Norton, 2006. BURNE-JONES, Edward. Study of Woman. Charcoal and red chalk, heightened with white, on blue-grey paper. 1890. 31.4x23.5 cm. Private collection. Print. Le Symbolisme en Belgique. Michel Draguet. Bruxelles: Fonds Mercator/Musées Royaux des Beaux-Arts de Belgique, 2010. 175. KHNOPFF, Fernand. L’Isolement (Isolation). Triptych composed of Solitude (central panel, charcoal and white chalk on paper, 1890-1891, 150x44 cm, Neumann Collection, Gingins, Switzerland), Acrasia (left-hand panel, charcoal and white chalk on paper, 1894, 150x43 cm, private collection) and Britomart (right-hand panel, pastel and white chalk on canvas, 1894, 150x43 cm, private collection). Print. Fernand Khnopff. Exhibition catalogue. Bruxelles: Musées Royaux des Beaux-Arts de Belgique. 106.
. Acrasia. The Faerie Queen. Oil on canvas. 1892. 150.8x45 cm. Musées Royaux des Beaux-Arts de Belgique, Brussels. Web. 10 September 2015. 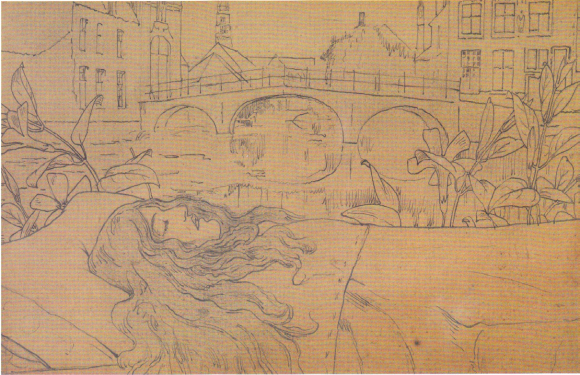 <http://www.fine-arts-museum.be/fr/la-collection/fernand-khnopff-acrasia-the-faerie-queen>.
. Des caresses. Oil on canvas. 1896. 50.5x151 cm. Musées Royaux des Beaux-Arts de Belgique, Brussels. Web. 10 September 2015. <http://www.fine-arts-museum.be/fr/la-collection/fernand-khnopff-des-caresses>.
. Study for a Sphinx. Pencil heightened with white. 1896. 23x15 cm. Private collection. Le Symbolisme en Belgique. Print. Michel Draguet. Bruxelles : Fonds Mercator/Musées Royaux des Beaux-Arts de Belgique, 2010. 175.
. Hérodiade. Crayon and charcoal on paper. c. 1917. 20.4 x 16.4 cm. Private collection. Web. 28 February 2016. <http://www.onnovanseggelen.com/notable-sales/fernand-khnopff-grembergen-1858-brussels-1921-hrodiade-ca-1917>. MILLAIS, John Everett. Ophelia. Oil on canvas. 1851-1852. 76.2x111.8 cm. Tate Britain, London. Web. 10 September 2015. <http://www.tate.org.uk/art/artworks/millais-ophelia-n01506>. MOREAU, Gustave. L’Apparition. Watercolour. c. 1875. 106x72 cm. Musée d’Orsay, Paris. (an oil on canvas, to be found at the Musée Gustave Moreau, picks up the iconography of the watercolour. [L’Apparition. Oil on canvas. c. 1875. 142x103 cm. Musée Gustave Moreau, Paris.]) Web. 10 September 2015. <http://www.musee-orsay.fr/en/collections/works-in-focus/graphic-arts/commentaire_id/the-apparition-11024.html?cHash=6df4efb7b5>. MOSSA, Gustav-Adolf. 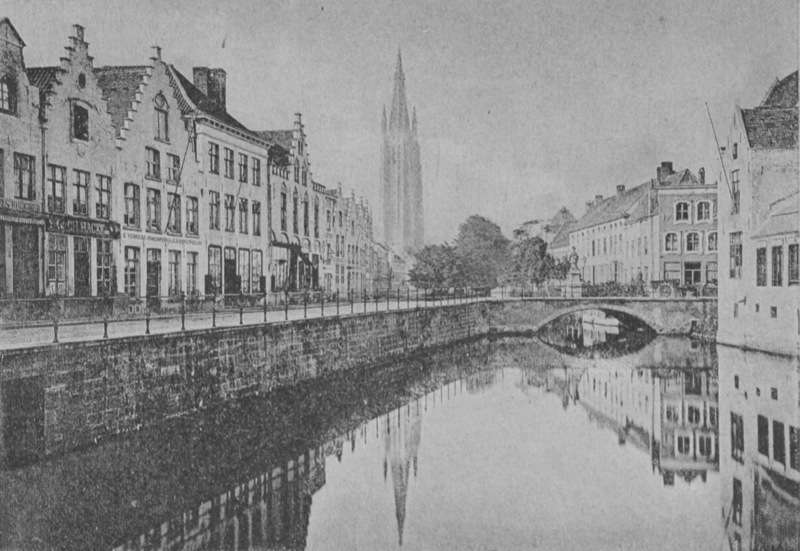 Bruges-la-Morte. Watercolour. 1911. 48x24 cm. Private collection. Web. 10 September 2015. <http://www.johncoulthart.com/feuilleton/2011/01/22/the-art-of-gustav-adolf-mossa-1883-1971>. 2 The portrait of the Belgian visual artist in the Hollinghurst novel is partly based upon the life and works of Fernand Khnopff (1856-1921), who spent his childhood in Bruges. 3 Hollinghurst also translated plays by Racine into English (Bérenice and Bajazet. London: Faber, 2012). According to my research, the first English translation of Bruges-la-Morte, by Thomas Duncan, dates back to 1903. 4 It is likely that Rodenbach was involved in the choice and positioning of the illustrations (Edwards 47). Many later editions unfortunately omitted the illustrations (Rodenbach 1998, introduction, 8). 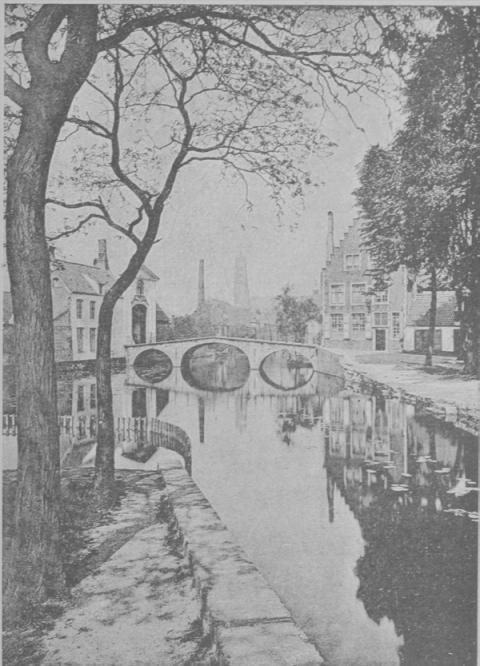 The 2005 edition of the translation of the novel published by Dedalus (with an introduction by Alan Hollinghurst) includes 17 modern- day black-and-white photographs of Bruges (see “A Note on the Photographs”, Rodenbach 2005, 165) which, like the 1892 illustrations, represent canals (31), empty streets (43, 51), the béguinage and Lake of Love (73-77). The 1903 edition of Bruges-la-Morte presenting a translation by Thomas Duncan only features three illustrations: a photographic portrait of Rodenbach (frontispiece), Khnopff’s frontispiece (facing p. 88) and a picture of béguines (facing p. 211). Rodenbach’s novel also inspired several artists, including Gustav-Adolf Mossa (1883-1971), a symbolist painter from Nice (Bruges-la-Morte, watercolour, 1911) and German musician Erich Wolfgang Korngold who adapted it as an opera (Die Tote Stadt, 1920). 5 The impression of musing in a picture gallery recalls Dorian Gray’s “strolling” through the picture gallery of his country house in the eleventh chapter of Oscar Wilde’s 1891 Picture of Dorian Gray (119-121). 6 This awe-inspiring wandering common to both Bruges-la-Morte and The Folding Star cannot fail to be reminiscent of Dorian Gray’s unveiling his secret to Basil as Dorian had him visit the disused room containing the actual portrait of Dorian Gray (The Picture of Dorian Gray 129-131). 7 The two novels bring to mind Wilde’s meditation on the depth/surface binary and the relationship between text and image in The Picture of Dorian Gray. 9 The metaphor of the labyrinth is used in Bruges-la-Morte (« le dédale embrumé des rues de Bruges », Rodenbach 1998, 79 [“the misty labyrinth of the streets of Bruges,” Rodenbach 2005, 36]) and picked up again in The Folding Star (“quaint labyrinth of the city,” 162). 10 During the fifteenth century, the waterway linking Bruges to the sea silted up. This point is developed by Rodenbach in “L’Agonie des villes” (“The Death Throes of Towns”), an article published in the literary supplement of Le Figaro(June 16 1888; reprinted in Rodenbach 1998, dossier, 306 and translated by Will Stone, Rodenbach 2005, 141-161) and echoed in Edward’s statement in The Folding Star: “Yes, things have been a fraction on the dull side since about 1510” (150). 11 For a complete list of the captions of the illustrations and an account of their original placing, see Edwards 47. The photographs come from the Lévy-Neurdein collection and were indeed also used as postcards (Edwards 47-53). 12 The main exception is the eighteenth illustration (Rodenbach 1998, 159), which pictures béguines. Some human figures can be made out in other illustrations (for instance Rodenbach 1998, 95, 114, 195), but they are very small and seem to be an irrelevant detail in the photographs. 13 A Jew, Edgard Orst hid from the German occupants during World War 2. He was discovered because of Paul Échevin’s affair with a Nazi officer. Paul Échevin has subsequently worked as curator of the Orst Museum to atone for his guilt. (Hollinghurst 406-415). 14 This is possibly reminiscent of E. M. Forster’s Maurice, in which Alec and Maurice visit the British Museum (Forster, Maurice, 192-198). Forster is a major influence on Hollinghurst, who wrote an M.Phil thesis entitled The Creative Uses of Homosexuality in the Fiction of E.M. Forster, L.P. Hartley and Ronald Firbank. The Forsterian intertext is very present in Hollinghurst’s The Stranger’s Child (2011), see Giudicelli. 15 Salomé and her mother Herodias are often hardly distinguishable one from the other. 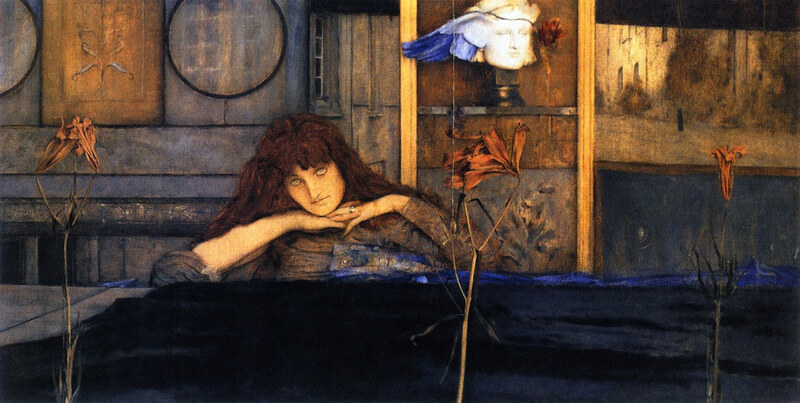 Herodias was represented by Khnopff (Hérodiade, 1917), who also painted other mythical femmes fatales, such as in Acrasia. The Faerie Queen (1892) or in Des caresses(1896). 16 In the novel, the windows of Edward’s flat look onto the aptly named school of St. Narcissus. The character later reflects on the figure of Narcissus, laying stress on the conflation of the Catholic saint and the Greek mythological character: “I wasn’t quite sure I got this Narcissus business: Luc, in the hagiological phase of our chat, had said that the saint was an early archbishop of Jerusalem, whose bones had been brought back by Godefroy de Bouillon from the crusade of 1099. But this plausible legend seemed to have been wilfully confounded with the pagan myth of the boy-flower.” (Hollinghurst 31-32). 17 A further parallel is between Edward and Paul Échevin, the curator of the Orst Museum. It turns out that Paul is, like Edward, cherishing the memories of his first homosexual encounter during World War 2 when, at the age of 17, he secretly met up with a German army officer, who would later be involved in Orst’s death. 18 For instance, Edward tries to initiate both Dawn and Luc to English poetry (see Hollinghurst 45, 247). 19 This is akin to the numerous portraits of Jane Morris by Pre-Raphaelite painter Dante Gabriel Rossetti. 21 Rough Common, like Stanmore Hill in Hollinghurst’s 2011 The Stranger’s Child, is also situated in “Forster territory,” namely suburbs that used to be rural before World War 1 and have now become part of Greater London. 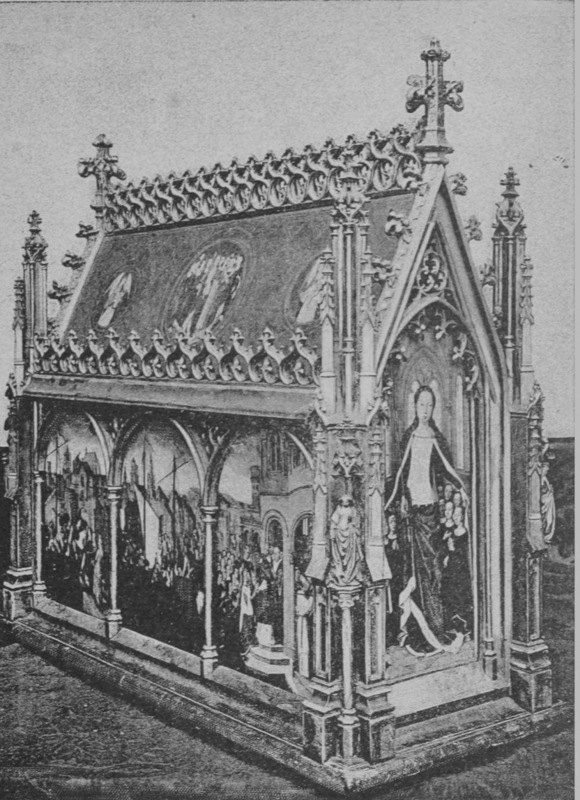 22 In Hollinghurst’s novel, the parallel between England and Belgium is also suggested by a certain number of coded allusions (which pertain to the gay subtext), for instance to Oscar Wilde’s Importance of Being Earnest (1895), the cathedral in the unnamed Belgian town contains the shrine of St Ernest (21), Edward follows Luc to the seaside resort of Ernest-aux-Sablonnières (102-116). 23 If the seventeenth and eighteenth illustrations (Rodenbach 1998, 159) mirror Viane’s servant Barbe’s visit to the béguinage, many have only a tenuous link to the text. For instance, the belfry (91) does not bear a close relationship with Viane’s night at the theatre related in the chapter in which it is placed. 24 See Mallarmé’s famous 1897 Un Coup de Dés jamais n’abolira le Hasard (Mallarmé 1315-1325). Rodenbach and Mallarmé were friends: the French poet congratulated Rodenbach on Bruges-la-Morte, praising Rodenbach’s attempt to “turn the poem into a novel, the novel into a poem” (« faire aboutir le poème au roman, le poème au roman », letter to Rodenbach, June 28 1892, reprinted in Rodenbach 1998, 292). 25 Walter Pater. Portraits imaginaires. Trans. Georges Khnopff. Introduction Arthur Symons. (Paris : Mercure de France, 1899); Oscar Wilde. « Un Prince heureux. » Trans. Georges Khnopff. L’Ermitage, vol. 22, May 1901. See Dessy. 26 In 1894, Burne-Jones sent Khnopff his 1890 drawing Study of Woman, with a dedication, and in 1896, Khnopff sent Burne-Jones an autographed drawing, Study for a Sphinx (Draguet 175). 28 The character from Hamlet was turned into a myth at the fin de siècle, giving rise to many variations in art and in literature. One of the most famous depictions is by Pre-Raphaelite John Everett Millais (Ophelia, 1851-1852). For more details, see Cousseau. 30 Grey is the dominant colour in Rodenbach’s depiction of Bruges. Chapter 6 expands on that colour: « Il y a là, par un miracle du climat, une pénétration réciproque, on ne sait quelle chimie de l’atmosphère qui neutralise les couleurs trop vives, les ramène à une unité de songe, à un amalgame de somnolence plutôt grise. C’est comme si la brume fréquente, la lumière voilée des ciels du Nord, le granit des quais, les pluies incessantes, le passage des cloches eussent influencé, par leur alliage, la couleur de l’air – et aussi, en cette ville âgée, la cendre morte du temps, la poussière du sablier des Années accumulant, sur tout, son œuvre silencieuse » (Rodenbach 1998, 130-133; [“In Bruges a miracle of the climate has produced some mysterious chemistry of the atmosphere, an interpenetration which neutralises too-bright colours, reduces them to a uniform tone of reverie, to an amalgam of greyish drowsiness. It is as if the frequent mists, the veiled light of the northern skies, the granite of the quais, the incessant rain, the rhythm of the bells had combined to influence the colour of the air; and also, in this aged town, the dead ashes of time, the dust from the hourglass of the years spreading its silent deposit over everything” (Rodenbach 2005, 61)]. 31 There are actually three different versions of this image: a frontispiece produced for the eponymous collection of poems by Grégoire Le Roy (Paris: Léon Vanier, 1889), a crayon version, with white highlights, on grey paper (50x29.5 cm, private collection) and a crayon and white chalk version on blue grey paper (25.5x14.5 cm, New York, The Hearn Family Trust). For more details on Mon cœur pleure d’autrefois, see Goffin 64. 32 For instance, Khnopff resorted to the form of the triptych in l’Isolement (whose three panels are Acrasia [left panel], Solitude [central panel] and Britomart [right panel]), ca. 1890-1894. The triptych was reassembled for the Fernand Khnopff exhibition at the Musées Royaux des Beaux-Arts de Belgique in 2004 (see Azoury).